Siena II offers a ¾ back with removable head rest. The arms fold up parallel to the back for easy access. Front knee roll folds up onto the seat for standing while steering. It is fixed in a 12 degree position moves FWD and AFT, with various increments of lock. 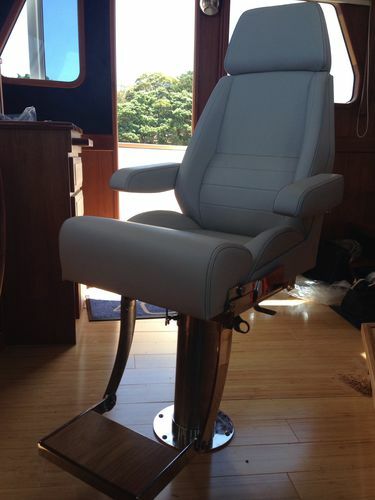 Footrest features a solid teak base surrounded by stainless steel, it is designed to fold into itself. It rotates 360 degrees on a gas pedestal and travels 200mm from its lowest point and can be locked. The entire structure is made from 316 stainless steel and aluminium. The chair can be cabinet mounted with manual or electric slide. The chair is suitable for Saloon or Flybridge.